Gravensteen (Dutch for “Castle of the Count”) is a massive stone castle smack dab in the middle of a historic square in downtown Ghent. Rounding a bustling corner and seeing a full medieval castle with a moat and turrets towering over quaint Belgian cafes is one of the more random and stunning sights I’ve experienced in my European travels. 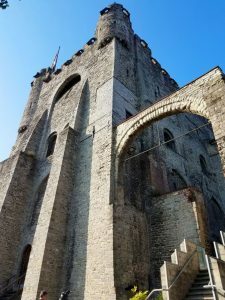 Gravensteen in its current form was built in 1180 by Count Philip of Alsace, and over the centuries was used as the seat of the Counts of Flanders, a courthouse, a prison, and a factory. It eventually fell into disrepair, its walls crumbling and its stone used to build other structures, but the city of Ghent saved it from demolition by buying the property and renovating it beginning in 1865. Aside from a tour of the extensive grounds, halls, and towers, your admission (10 Euro) grants you access to multiple exhibits featuring Medieval armor and weapons. The most popular exhibit is the torture museum, which showcases the methods used to extract information from prisoners detained in the castle’s subterranean dungeons while awaiting trial. Pretty gruesome stuff, for sure. Leonard Kinsey is the owner of Bamboo Forest Publishing, and the bestselling author of "The Dark Side of Disney", the Anarchist Cookbook of Disney travel guides. He's lived in Baltimore for over 15 years, and enjoys drinking craft beer in unique places, eating nachos and pizza, listening to 80s hair metal, and arguing about Star Trek minutia, often all at the same time. Watch out ladies! Contact the author.